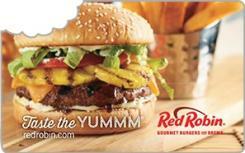 Earn 5.4 SB per $ when you buy Red Robin gift cards at MyGiftCardsPlus, powered by Swagbucks. Hamburger fans are chirping about Red Robin Gourmet Burgers. The company operates a chain of more than 420 casual-dining restaurants in 40 states and Canada that specialize in high-end hamburgers. Its menu features more than 20 different twists on the American classic, including the Banzai Burger (marinated in teriyaki), Bleu Ribbon Burger, and the jalapeño-charged 5 Alarm Burger.